I love the springtime. Sure that means warmer weather and pretty blooming flowers, but what it really means is new clothes! Most apparel companies will launch their new gear in the spring and fall so naturally I get pretty excited when this time of year rolls around so I can see all the new offerings of the season. One brand that I am always keeping an eye out for is Golftini. The reason I pick this brand each and every year is because this is a company who sticks to their roots. It was the skort that made Golftini and it’s the skort that keeps them flourishing year after year. This isn’t to say that they don’t have incredible tops, because they certainly do, but it will always be their skorts that keep me coming back. All their items are made in the USA and each fabric is hand picked and each style is uniquely created by the owner. Color and pattern options cover a vast range of choices allowing a golfer to choose from subtle to sophisticated to sassy. 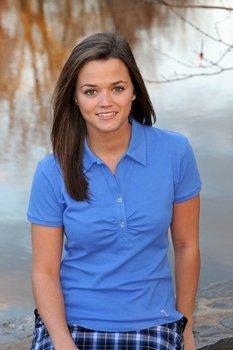 Sweaters, polos, tees and tanks are made to match any skort in the Golftini collections. Now that temps are on the rise it’s time for this reviewer to go shopping! So with the help of the amazing ladies at Golftini I have three incredible outfits to discuss here from their Spring 2011 line. First outfit on the runway is the perfect pink ensemble for the springtime sunshine. The bottoms is, of course, a skort. This skort is called Pink Squares, and the name says it all, it has pink and white squares all over it. I noticed something new about the fit of these bottoms. It appears that Golftini has added a little bit of length to their new line of skorts and I must say I like it. I am a bit modest when it comes to my legs so when it comes to showing them off I have always felt less is more. Sizing has stayed exactly the same, which for me, has always been quite true to size. To keep the focus on the beautiful shade of pink in the skort Golftini has paired these bottoms with a white polo. What I love about the polo is that it’s not just a plain white polo it has some shape and texture to it to give it a lovely feminine appearance. Golftini does such a wonderful job of adding great feminine touches to all their pieces. 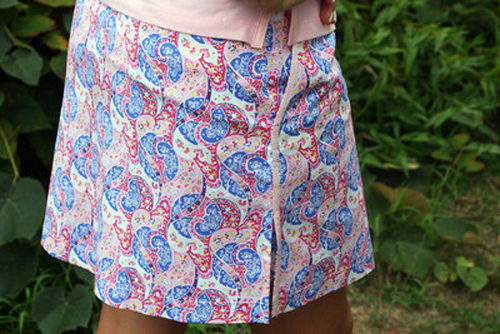 For a totally different and very unique look we have the Pink Paisley Skort paired with a matching blue polo. When I first saw this skirt I will admit it wasn’t my cup of tea. The pattern was a little too ‘New England’-ish for me. I loved the colors but the pattern wasn’t all that visually appealing to me. However, I wanted to try it on because if there is one thing I have learned through my fashionista career is that you never really know how something looks until you try it on. Once I wore the skort the pattern grew on me quickly. When paired with the blue polo the whole outfit really comes together. Just like the skort above the fit here is very true to size and the slightly addition in length is a major plus in my book. The final outfit we tried was my favorite. Normally I am drawn to the pinks and purples, I admit I definitely have a bit of that girly girl in me, but this outfit is all black and white. Rings is the name of the skort and appropriately so because it is an all black bottom with white circles or rings all over it. For some reason the rings remind me a bit of bubbles. It really doesn’t look like bubbles but for some reason that’s what it reminds me of. It has an almost retro 1970’s look to it that I just love. Pair this with their black sweater tee and you are ready for the links or some drinks with friends. I found myself wearing the black sweater tee not only with this skort but with jeans as well. The fit of the top is a little on the larger side but it works. It still looks great, but allows for a little extra room for those days when you just don’t want to be wearing something clingy. Whether you are feeling flirty in pink, relaxed in pasley, or groovy in black and white the new spring line from Golftini has a skort to fit your mood. What you are seeing here is truly just a small sampling of all the great designs and colors that they offer. To find out more about Golftini and all the great tops and bottoms they have for spring you can visit their website here. Nice review GG. I showed it to my wife and she promptly “asked” me to remember the pink squares skort when I shop for her birthday in June. She too said shed be a fan of a bit more length to the skort. Very nice review GG. My wife would look awesome in those outfits but I need to get her on the course first. The last outfit is hot! I love that these guys are making their products in the USA as well. Nice job on the review, GG. Great review for great looking clothes. Love the Ring outfit. Great write up GG! I like that paisly skort a lot. The Ring skort is interesting to me. I like it and don’t like it, I’m not so sure about it, but the more I look at it the more it grows on me. I wish my significant other was into golf, she’d look incredible in some of this gear. I’m glad you like this line, it looks sharp! Nice review. I will show my wife this line. She is always looking for stylish clothing for the course. Some great looking stuff there GG!! The white pole would good very well with the Rings Skort too. Great looking apparel! I really like the looks of their skorts and the buttonless polos are already a favorite of mine. Trying to decide between the blue daisies or the paisly skort for May. Nice review GG! I like their design a lot! Do you know how well these hold up to the test of time and also I noticed on their website that the skorts are 97% coton and 3% spandex, does this make them feel heavier and/or hotter than more techie fabrics (drif-fit or climacool)? Love the retro look of the ‘Rings’ skort!!! Groovy review GG! Very good review GG. I think my wife will like a lot of those skorts I see in the pics. Absolutely Love the style and have seen this before. Just wish they made some larger sizes.